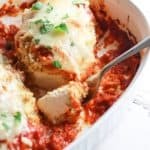 A delicious, double coated chicken parmesan that comes together quickly and bake for 30 minutes. In separate bowl, or shallow plate, mix the egg wash mixture. Whisk well, ensuring everything is combined. In separate bowl or shallow plate, mix the chicken coating mixture. Coat chicken in egg wash, then in coating mixture. Repeat dipping in egg wash and coating again to double coat chicken. Place chicken in pan. Pour 1 cup of marinara sauce around the chicken. Use remaining 1 cup to coat chicken breasts. Top with shredded parmesan cheese. Bake for 25-30 minutes, or until chicken reaches 165 degrees Fahrenheit internal temperature. Take time to blend your parmesan for your chicken coating. It helps give a crispness to the chicken that makes a huge flavor difference. Use paper plates for the coating and the egg wash. It saves dishes and works just as well! Make sure you put your chicken breasts in your pan first, before you add your marinara, It helps keep the bottom of the chicken to not get soggy. Don't have parmesan? Shredded mozzarella is fine, too. Vegetarian? Use eggplant in place of chicken. Layer in a casserole dish for a fun spin!